Glued to your smartphone? Soon it will be glued to you. On average we now spend a whopping 1/3 of our waking day looking at our smartphones, staring into those small screens and filtering through an endless stream of content. The largest companies in the world are scrambling to find the solution (or evolution) to the problem. The tech industry isn’t concerned about the ramifications of our addiction – to them, the issue with small handheld devices is in the name; they’re small, and they are handheld. Even with the frameless, bezel-free design of newer models, integrating this technology with our day-to-day lives is limited by a phone’s physical constraints. This is based on a wider principle of digital evolution. From the point-and-click of a mouse through to the more intuitive gestures of a touchscreen, each iteration of device shortens the ‘chain of command’ and in doing so enhances our sense of ‘presence’ within the digital world. So what is the next step on from touchscreen? Most are betting on Virtual/Augmented Reality, or more accurately the all-encompassing term Mixed Reality (MR). For a brief moment, Pokemon Go seemed to open the floodgates for AR, but the very brevity of the craze meant many regarded the technology as a mere fad. Meanwhile, Google Glass’ failed attempt to lay down the gauntlet in the wearable market seems to highlight the public’s reluctance to be a ‘Glasshole’. The brute force of Facebook and Google’s duopoly within the advertising world may be daunting (together they brought in 84% of the western world’s spend on advertising in 2017), yet we still use both services on our phones and computers day in day out, perfectly aware that these tech giants are profiling us based on our personal data. As Douglas Rushkoff warned us way back in 2011, “we are not the customers of Facebook, we are the product. Facebook is selling us to advertisers”. Perhaps the reason we continue this unhealthy relationship is down to the very subtlety of the adverts we eventually see. Facebook cleverly disguises advertisements amongst ‘organic’ posts within your news feed, whilst one study reports that 60% of consumers don’t know a Google advert when they see one. Another big factor in our continued affair must surely be that nearly all services from these two companies – as well as a vast amount of other online content – is completely free. This business model of free content in exchange for personal data and targeted advertising is one that Jaron Lanier, the heralded founder of VR, has warned against in a recent interview with the BBC (see above, from around the 3:55 mark). Will we see a continuation of this model when the world adopts MR wearable tech? If so, the upshot is that advertising will be more subtle than in Matsuda’s Hyper-Reality. We will also enjoy even more entertaining content without the need to pay for it. However, discreet advertising is not necessarily less powerful, and what we don’t pay for in cash (or Bitcoin) we pay for elsewhere. Perhaps we should listen to Lanier; it may be time to challenge the deal we have struck with the tech giants, before MR is mass-market and the Big Brothers permeate every aspect of our lives. Like it or loathe it, it seems the mass adoption of Mixed Realities is all but certain – a predetermined path that merely continues our waltz with modern technology. 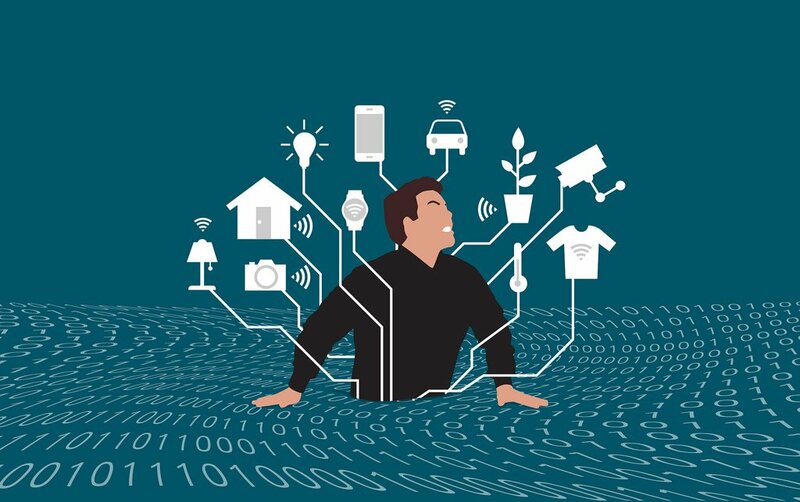 As we make the transition into ubiquitous wearable devices, it will be more important than ever to consider the control we have over our digital selves. It is also more pertinent that the industry considers the impact of the content it creates, and it’s a topic we focus on when creating immersive experiences here at Happy Finish. Despite concerns and no matter what your opinion, the future is undeniably exciting. The boundaries between our physical and virtual realities are becoming evermore blurred. This might be a scary thought – but surely it’s ultimately preferable over straining your eyes and cramping your neck as you stare into a 5-inch screen? Soon we will step through that small window and into the immersive world of digital hybridity. My guess is that we’ll never look back.